Sachin Tendulkar is called ‘The Little Master’ by his fans and is one of the greatest batsmen in the history of cricket. He is the only batsman to score a double century in the history of one day internationals. He is ranked as the 2nd greatest test batsman after Sir Donald Bradman, and 2nd greatest ODI batsman after Viv Richards. He has scored maximum number of test and ODI centuries. Brian Lara is West Indian Batsman and holds a number of records in first class cricket including that of scoring the maximum number of runs in first class cricket; a whopping 501 not out against Durham in 1994. Sachin was born in Bombay, Maharashtra. He attended MRF Pace Foundation in his school days to learn fast bowling where an Australian fast bowler Dennis Lillie suggested that he concentrate on his batting instead. In his school days he had a reputation as a cricket prodigy. Sachin and Vinod Kambli had a partnership of 664 runs in an inter school game in 1988. Brian Lara attended weekly coaching sessions at a local coaching clinic. At the age of 14 he entered the Fatima College where he began training under coach Harry Ramdaas. At the age of 15, he played his first under-nineteen tournament. Sachin has scored the maximum runs in one day internationals (17,598). He scored 49 centuries in test cricket and 46 in ODI cricket – both being maximums. His contribution to Indian cricket has been acknowledged with the award of the Rajeev Gandhi Khel Ratna Award, the Arjuna Award, Padma Shri and Padma Vibhushan. He has been chosen 60 times as “Man of the Match” in his international “one day” career. Brian Lara on the other hand holds the record for scoring the highest number of runs in a test inning; a 400 not out against England in 2004. He is the only batsman to score a quintuple century in first class cricket. 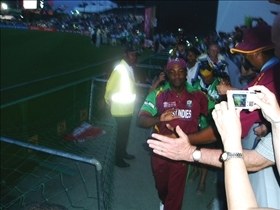 Brian Lara is popularly known as the prince of Port of Spain by his fans. 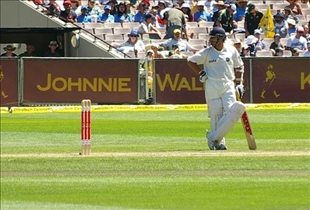 Tendulkar was charged with ball tampering by umpire Mike Denness in the 2nd test against South Africa in 2001. He was awarded a one test match ban by the referee. Although after complete investigation by the International Cricket Council the charge and ban were lifted and Mike Denness wasn't allowed to attend the third test after allegations of racism were charged against him. Brian Lara asked Dhoni to walk off the field as his fielder assured him that he has caught Dhoni on the boundary but the replays were inconclusive as to whether the fielder stepped on the rope or not. Lara was called by the referee and was asked for an explanation of his action but was not fined. Sachin is ranked as second greatest test batsman after Sir Donald Bradman, and second greatest ODI batsman after Viv Richards. Was born in Bombay, Maharashtra. Sachin has scored maximum runs in one day internationals (17598). Rajeev Gandhi Khel Ratna Award, the Arjuna Award, Padma Shri and Padma Vibhushan. At the age of 15, Lara played his first under-nineteen tournament. Holds the record of scoring highest runs in a test innings; a 400 not out against England in 2004. Only batsman to score a quintuple century in first class cricket. Brian Lara is popularly known as the prince of Port of Spain. Who is the best cricketer? Sachin Tendulkar, undoubtedly is one of the greatest batsmen in the history of cricket. However, he is marginally below Viv Richards, Brian Lara and Gary Sobers. No arguments. Ask Wasim Akram, Imran Khan, Glenn Mcgrath and Muttiah Muralidharan - who is the best , Sachin or Lara? One might say ask Shane warne, Andy Flower, Jason Gillispie? Well, Wasim, Imran, Glenn and Murali - their comment holds more importance than any others, because they played against Sachin and Lara and knows them very well plus they are superior than any other since 90's..
Could n't agree more. Lara is the most underrated cricketer. Sachin is also a good cricketer, but can he win matches on his own? and the answer is a big NO. He is not even close to his peers like Inzamam-ul-Haq and Ricky Ponting. Test match winning percentage of Inzamam-ul-Haq is 68, Ricky Ponting is 63 and finally Sachin Tendulkar is 38. At the end of the day, winning matters the most. Media created so much hype about Sachin. Mcgrath has said Tendulkar was better. We all are mortals. Modesty is all. right now in this world 14 country are playing cricket.but in all cricketer sachin made lot of run in ane day and test cricket as well.you should know in the history of one day cricket only sachin is the one of batsman who made 200 run i think this record would long lasting .as for my evaluate sachin is the better player in the every formet of the cricket. hi **** fistly i will wish to all of team for world cup 2011 and i know that all the team will perform his level best and i hope that in all of the team india will be winner of this world cup.beacuse this world cup is orgnaising in the india not only india but srilanka and bangaldesh as well. you can say this world cup are orgnaising in asia .it is the fact forever since when wolrld cup orgainaised in asia only asian team won the world cup and i know that in all of the asian taem india is the best because this indian team has lot of capiblity for win the world cup and this team is unique team and cobination of youth and experiance as well. Brian Lara is the most entertaining to watch and I believe that if Lara was not victim to the many controversial outs he has received,(which many of us forget)he may have achieved greater results in this game..
Leaving Indians all will say Kallis and LARA is superior, even i must say that INdia produced Gavaskar and Dravid as best cricketers, just ask from Macgrath, Wasim, Shoaid, Lee they all will say Dravid and lara are the most toughest amongst indian media hyped tendulkar. Could n't agree more..I am an Indian.I always though media is simply praising Sachin.Dravid is a much much greater player than Sachin.CHeck his avg in abroad.He holds the highest avg.The only Indian player who got 8 man of the match Awards in Tests away home is Dravid.I simply cannot understand If he is the so called "GOD of cricket".! !why the heck he cannot score a triple century? ?Even Sehwag scored 2 tripltes just like that? ?How can some one even consider a guy who batted for 21 years and never scored a triple and still compared with LARA? ?..He is the most selfish cricketer I ever seen.Just the see the match against Bangaldesh in Asia Cup Finals..He and All our media celebrated it but we lost the cup.bloody sachin scored his 100th 100 in extremaly slow pace.I agree bowlers didnt do well..Still in that close game India was definitely short of 30 or 40 runs and that is simply because of Sachins selfish Innings..